Beware of the incoming cold in Santa Cruz! Santa Cruz.- The Government of Santa Cruz through its Agrometeorology System has issued an alert bulletin that foresees that this weekend will enter a cold front, with cloudy skies and possible drizzles and in the middle of the week there will be temperatures below 0° Celsius . 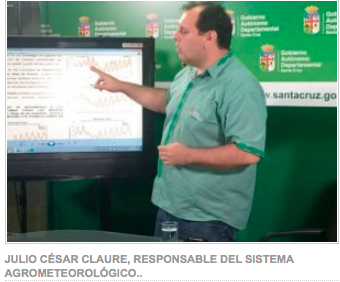 Julio César Claure, responsible for the Agrometeorological System of the Government, reported that the municipalities in which temperatures are estimated to be -8° C are: Postrervalle, Pucara, Vallegrande, Camiri and Cuevo in the early hours of Tuesday 18, Wednesday 19 And Thursday 20, is why he called on producers to take the necessary precautions to avoid the loss of their crops, using cold mitigation methods. Similarly, Claure added that in the rest of the department, the average minimum temperatures will be 9° C. It is expected that on Friday 21 the north direction winds return and temperatures rise.